Enough with the teasing already, your killing me. Been watching the other thread for a while and anxiously looking forward to the release. This will be a great addition to my two PL8s. And I thought CCS was great. This is a whole new world of charging versatility and charger case build options. You will not be disappointed. Bump data transfer has been 100% accurate on the packs I have been using. Revolectrix wants to be 100% sure this is ready for the consumer. Patience will be rewarded. 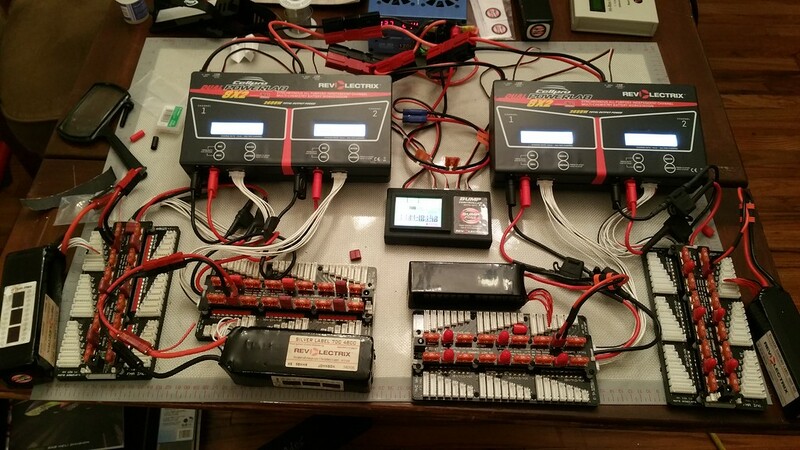 Bump Controller being tested on 2 PL8 Duo's. MA Whiplash 90E, SAB Goblin 700, Logo Xxtreme 800 and Banshee #25. I am near Conroe, north of Houston. That you Jack? We met at SRC a couple of years ago when you demoed the hard deck. No, my name is Dale. I was probably with Jack. Was that when we demo'd copilot. I owned the Raptor Jack was flying. I believe Jack was flying a Trex 600 demoing the new hard deck module. Believe it was the 2012 SRC event in Pittsburg. Being fortunate enough to have been selected as a beta tester I have to say it has been nothing short of a positive experience. It is a pleasure to collaborate with fellow hobbyists that come up with excellent Ideas. I have been unable to actually fly due to weather and family obligations up until this weekend. Finally getting to the field and actually using the Bump controller outside of a test environment . I can honestly say this is what I have been waiting for, charging is now as simple as Bump, Connect and Go. I see a PowerLab and BUMP controller in my future, around 3Q 2016. Last edited by TheBum; 10-11-2015 at 10:49 AM.. I was also very privileged and honored to have been involved with the beta test program. I am not only very impressed with the product, but also the thoroughness and devotion to excellence that I have seen FMA and Revolectrix have toward this product release. I have been involved with several beta releases of multiple products in multiple industries, and the work behind the scenes that these companies have put in is outstanding. I not only wholeheartedly recommend this product because it's a great product, but behind it also are great people who care about excellence and service. You owe it to yourself to check this one out. Got into a charger discussion at a FF this weekend, shared my very limited knowledge of the Bump Controller. Seems to perk up a lot of interest in the product and finding out more about it. What about "small BUMP" - 1 channel device, probably w/o touch screen? Just like NFC reader connected to one PL6 or GT500 charger? You would then be restricted to using a tablet or phone to perform the initial programming of the tag. If you want one channel then that's all you have to plug in. The display on the bump will reflect only 1 channel as well as the Tablet/ phone app. No plans to support the GT500 as far as I know. The BUMP uses the existing interface on the PowerLab chargers (similar to the way CCS communicates with the charger). Not sure it would be cost effective or there would be much demand for a 1 channel device. So we really liked the idea of investment protection for our existing PowerLab owners (which is the bulk of our product install base) as the entry point for this new technology. This install base, combined with what we believe is the right feature set, will help push up volumes and allow us to invest in new Bump products in the future. And based on feedback so far, we may have actually underestimated the demand .... a great problem to have !!! I see that the Android software will come in two stages, but when listing the iOS software, it just says initial release and doesn't mention a second release. Is it planned that the initial iOS release in 3Q 2016 will have same level of CCS as android will have at that time? Or will that require waiting for a second update of iOS software? The goal is to have the same level of support as listed in the Android version by fall 2016 - so it will include graphing and battery history/reporting functions. Any estimate on the cost of the tags? I'm guessing it's very small since it's not mentioned. It was mentioned in another thread that they will be very inexpensive. We don't have solid numbers worked out with manufacturing, but expect the BumpTag street price to be in the $1.25-$1.50 range depending on quantity. Don't hold me to those exact numbers, but that's the target. We obviously want to keep it as low as possible to promote usage, so we will do our best to keep the cost down. NFC tag programming not a question at all, just check Android app store for NFC tools(pro) for example. Mobile connectivity? For what? By my opinion, people will like simple, not expensive controller for their chargers, which will be able do simple task - read NFC from battery pack and select corresponding profile on charger. Start button? Well, I can press on charger Storing battery history/state? Yes, nice feature, but it could be just software (app/db) on your PC/Phone.